Wayne Grudem says that for twenty-five years he has believed that how the Trinity is understood “may well turn out to be the most decisive factor in finally deciding” the bitter debate between evangelicals about the status and ministry of women.1 This is encouraging to hear, because Grudem and many of his fellow complementarians have got the doctrine of the Trinity completely wrong. On the status and ministry of women they can quote verses in support of their position, and egalitarians can quote verses in support of their position, and so we end up in a text jam without an external adjudicator to say who is right or wrong. But with the Trinity it is different. The doctrine of the Trinity is exactly and unambiguously defined by the ecumenical creeds and the Reformation and post-Reformation confessions, enunciated in detail by the great Trinitarian theologians of the past such as Athanasius, the Cappadocian fathers, Augustine, Aquinas, and Calvin, and spelled out carefully today in the numerous scholarly books on the history of the development of the doctrine of the Trinity.2 Thus what each side is claiming to be the orthodox doctrine of the Trinity can be evaluated against evidence; the facts of the matter can be checked. Both sides cannot be right. After debating with my complementarian friends on the Trinity for more than fifteen years in numerous publications, I am more than ever convinced that the complementarians are the ones who have it wrong—dead wrong. The creeds, the confessions, and virtually all the great theologians of the past and present reject completely any hierarchical ordering in divine life. Because egalitarian evangelicals generally do not appeal to the Trinity for male-female equality, since they do not think it is relevant to this issue, they do not have anything novel to say on this doctrine. Millard Erickson,8 Tom McCall,9 Keith E. Johnson,10 Robert Letham,11 and myself,12 as well as other informed evangelicals (gender complementarians and egalitarians alike), who have written in opposition to the Knight-Grudem-Ware doctrine of the Trinity, simply want evangelicals to remain faithful to what the church universal has agreed is what the Bible teaches on this centrally important doctrine. In all my writings on the Trinity my one aim has been to articulate the Nicene faith as it is expressed by Athanasius, the Cappadocian fathers, and Augustine, summed up in the Nicene and Athanasian creeds, and reaffirmed by Calvin and in the Reformation and post-Reformation confessions, thus showing that what most complementarians are teaching on the Trinity is not historic orthodoxy. I am strongly of the opinion that neither side in the debate about the status and ministry of women should appeal to the Trinity. The doctrine of the Trinity is our distinctive Christian doctrine of God, the primary and most important doctrine; it does not set a social agenda of any kind. To argue that the Trinity supports gender equality or women’s subordination is simply bad theology and bad thinking. How a three-fold divine relationship, or specifically Grudem and Ware’s “male- male” divine Father-Son relationship, might prescribe a two- fold, male-female relationship on earth cannot be explained. Correlation is not possible. Ware and Starke’s book is not easy to review because most of the eleven chapters show virtually no understanding of the key elements of the creedal and confessional doctrine of the Trinity. The same errors are endorsed time and time again, and often what is asserted makes little sense. Then we have the problem that two essays outline orthodoxy in opposition to all the other authors, but the editors do not acknowledge this, and a third chapter on the beliefs of particular Baptists in eighteenth century England has no connection with what this book is about. Letham’s entirely orthodox chapter on the doctrine of the eternal generation of the Son, a doctrine confessed in the Nicene Creed, endorsed by all the Reformation and post-Reformation confessions, and taught by almost every significant theologian across history, is, we should carefully note, written in opposition to those who reject this doctrine, most importantly Grudem and Ware. Finally, I point out that the editors and most of the contributors seem to believe that all those on the egalitarian side are for a co-equal Trinity of persons and all those on the complementarian side are for a hierarchically ordered Trinity, but this is simply not true as this book’s selection of contributors illustrates. Letham and Oliphint, who have chapters in this book, and Keith E. Johnson, who is sharply criticized in it for opposing the Knight-Grudem-Ware doctrine of the Trinity, are complementarians on the gender issue. These men believe in the permanent subordination of women but not in the eternal subordination of the Son. To assert that Erickson, Linda Belleville, and I “reject the authority of scripture” simply because we point out that the title “the Son” is not the only title given to Jesus Christ, and that some other titles are more commonly used, is absurd.18 To accuse Erickson of rejecting the authority of scripture is also absurd. Erickson has been a defender of biblical inerrancy all his professional life. Finally, Grudem accuses evangelical egalitarians who have written on the Trinity of “ignoring verses that contradict” their position.19 This again is simply not true. I am willing to consider any verse in the Bible that might inform me better on divine triune life. Most of the verses Grudem lists, that he says Erickson and I ignore, speak of “divine order”—how the three persons work cooperatively in an unchanging and irreversible pattern. We do not discuss them because we have no problem with them. They do not speak of a hierarchical order. And contra Grudem’s claim, the Father is not always mentioned first in Trinitarian texts in scripture, as Letham points out in explaining scriptural teaching on order in divine life and action.20 In this section I get another broadside for arguing that isolated verses that seem to stand in tension with what is dominant and theologically deepest in scripture should not be absolutized, and that “simply opening our Bibles cannot settle what should be believed about the Trinity.”21 I stand by both assertions. As a confessional Christian I come to scripture assuming that the creeds and my own church’s confessions of faith will guide me to a right understanding of the many diverse comments I find in scripture on most if not all of the great doctrines. Without their guidance I could easily read my own views into scripture and fall into heresy. Throughout this chapter Grudem shows a breathtaking ignorance of the historic doctrine of the Trinity, as do most of the other contributors to this book. The Nicene Fathers were totally opposed to the subordination of the Son in being, power, or work. For them the eternal generation of the Son does not imply the Son’s subordination—just the opposite. It speaks of him as God in the same sense as the Father, omnipotent God. No Nicene father ever suggests that creaturely words such as “father” and “son” can define the triune creator; indeed they explicitly oppose this idea. The Son is confessed as “the Son” because through his eternal generation by the Father he is other than the Father and yet one in being with the Father. Lewis Ayres, arguably the most informed patristic scholar on the Trinity at this time, says, “It is fundamental to all pro-Nicene theologies that God is one power, glory, majesty and rule, Godhead essence and nature.”22 If the divine persons are one in power, they are each omnipotent and thus one does not rule over another. Ayres also says that “one of the most important principles shared by pro-Nicenes is that whenever one of the divine persons acts, all are present, acting inseparably.”23 Again it follows, if the divine persons always work inseparably, one does not command and another obey; they work in perfect harmony as one. Complementarians cannot expect to be taken as serious scholars if they ignore or reject what Ayres and other well informed patristic scholars conclude. Why the editors positioned this ill-informed and wildly polemical chapter first raises many questions. Before considering in more detail what Cowan says in his chapter, I digress to give greater specificity to why I reject most of what he says and most of what most others say in this book. I strongly oppose their hierarchical ordering of the divine persons and particularly their subordination of the Son to the Father because this teaching contradicts the ecumenical creeds and the Reformation and post-Reformation confessions. For this reason it cannot be taken as an expression of orthodoxy. Eternally begotten of the Father, God from God, Light from Light, true God from true God, begotten not made, of one being with the Father. Through whom all things were made. For our salvation, he came down from heaven . . .
What this clause asserts is that, on the basis of his eternal begetting by the Father, the Son is God in exactly the same way as the Father. He is one with the Father in being and thus one in majesty, glory, wisdom, power, and authority. If I wanted to rule out of court any sub-ordering of the Son I could not say it better. Then we have the Reformation and Post-Reformation Confessions, binding on millions of Christians who belong to mainline Protestant churches.27 These with one voice decree that the Bible teaches that the divine three persons are one in being/ essence and power. The confession of the Evangelical Theological Society says the same. The terms “power” and “authority” are both divine attributes shared equally by the divine persons, and thus the terms are virtual synonyms. If the three divine persons have the same power then they have the same authority. The Reformed Belgic Confession of 1651 explicitly excludes hierarchical ordering in the same words as the Athanasian Creed and adds that the Son is “neither subordinate nor subservient” to the Father. Confessional evangelicals do not give to the creeds and confessions the same authority as scripture, let alone set these documents over scripture. Rather, they believe the creeds and confessions express what the best theologians from the past have concluded the scriptures teach holistically on doctrines that have been in dispute. They see them as both summaries of what the church universal should believe the scriptures teach, and the best guides we have for the right interpretation of the scriptures on the doctrines they articulate. 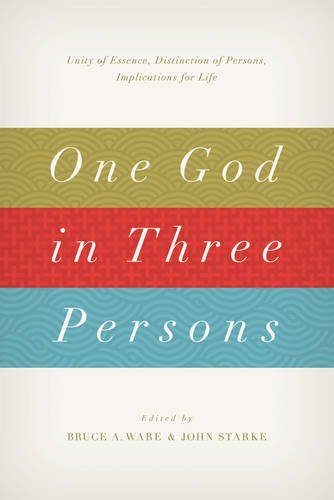 In this book, One God in Three Persons, there is no interaction with these weighty theological documents that enunciate what the universal church believes about the Father, Son, and Spirit. Their teaching is ignored.28 What this means is that most of the essays in the book reflect nothing more than the idiosyncratic opinions of individual men whose main agenda is maintaining the subordination of women. We of course do need to check if John’s Gospel teaches the eternal subordination of the Son in authority and thus hierarchical ordering in divine life, as Cowan argues, but for the moment we need to accept that hierarchical ordering in divine life is rejected by the creeds and confessions and endorsed by no orthodox theologian from the past. Indeed, for most patristic scholars it is seen as the essence of the various forms of fourth century Arianism. Letham, for example, says, “Arians of all shapes froze the triad into a hierarchy.”29 No one denies that in John’s Gospel, and occasionally elsewhere in the NT, we find texts that speak of the subordination of the Son, but for all orthodox theologians these speak of the Son “in the form of a servant” during his earthly ministry. Central to Cowan’s case is that frequently in John’s Gospel the Son is said to be “sent” by the Father. For him, and for most of the other writers in this book, this indicates that the Son must do as the Father commands; he is set under the Father’s authority and must obey him. This is an old argument; the Arians never tired of using it. Augustine says “they turn to the axiom: ‘The one who sends is greater than the one sent.’”30 In a reply to such Arian reasoning Augustine argues that sending does not imply, let alone indicate, subservience: only that the one sent comes from the sender. He thus concludes that, just as the terms “unbegotten” and “begotten” differentiate the Father and the Son, while not suggesting any subordination or inequality, so too do the terms “send” and “sent.”31 What Augustine clearly recognized is that creaturely words such as “begetting,” “sending,” “son,” and “father” cannot be applied to God univocally. God is not defined by human terms used of creaturely existence. When it comes to John’s understanding of the sending language, I argue that what is reflected here is the Jewish Shaliach principle, namely that the one sent has the same authority as the one who sends.32 Cowan will not concede this point. In answer to him I raise three points. First, no exegete should assume that creaturely words such as “father” and “son” and “sent,” when used in the Bible, should be understood univocally and literally. God cannot be defined in creaturely terms. Second, in John’s Gospel Jesus does see himself representing perfectly the Father because he has been “sent” by him (3:34, 5:23, 7:16, 28–29, 8:16, 18, 12:44–45, 49, 13:20, 14:24). And third, in John’s Gospel, while it is true that Jesus is sent by the Father and does his will perfectly, he is pre-existent God (1:1), who does the works of the Father (5:19, 9:4, 10:37), including those works that only Yahweh can do such as raising the dead (5:21, 6:40) and exercising judgment (5:22, 27–29, 8:16). What is more he identifies himself with Yahweh in the “I am sayings” (8:59, 6:35, 8:12, 10:7, etc. ), and after his resurrection he is unambiguously confessed as “The Lord” (20:18, 28, 21:7), Yahweh in all might, majesty, and authority. These observations remind us that we should never give content to titles used of Jesus Christ by appeal to fallen human life and relations. It is scripture that should give the content. When the NT writers call Jesus Christ “the Son of God,” his lofty status, not his subordination, is implied. Claunch agrees that the Greek word kephalē that literally refers to the top part of the body may have the metaphorical meaning of either “source” or “authority over,” but he says it must mean the latter in 1 Cor 11:3 because Paul in this passage is securing the subordination of women in the subordination of the Son to the Father.39 I am not convinced. The metaphorical meaning of a word, I agree, is best determined by context, and in this case context well-nigh rules out the meaning “authority over.” Why would Paul first say in v. 3 that man is head over woman and then immediately say in v. 5 that men and women can both lead in church by praying and prophesying, “the two principal exercises in public worship of the Early Christians”?40 And second, why would Paul say in v. 11 that women have “authority” on their heads if he thought authority was reserved to men? Positively, given the priority of context in determining the meaning of metaphors, the meaning “source” is to be preferred. In 1 Cor 11:9 and 12, the apostle has man/Adam as the source or origin of woman (Gen 2). This being so, then the clause, “God is the kephalē of Christ,” probably refers to the Father as the origin or “source” of Jesus Christ in the incarnation, or possibly to the Son’s eternal generation from the Father. Assuming that kephalē means “head-over” in this context, Claunch argues that 1 Cor 11:3 “does indeed ground gender complementarity in the immanent Trinity, albeit indirectly.”41For him, this text first of all speaks of the Son as subordinated to the Father in the economy, but he argues that this is then to be read back into the immanent Trinity. What this means is that what he gives with one hand he takes back with the other. The Son is not only subordinate in the economy; he is subordinated eternally. On taxis/order, Claunch is simply factually wrong.42 The biblical “order” is not always Father, Son, and Spirit, as 2 Cor 13:13 and many other Trinitarian verses demonstrate.43 Frequently the Father is not mentioned first. On Augustine he is also wrong. The great Latin-speaking theologian does not allow that the eternal generation of the Son implies a “Trinitarian taxis” of authority and submission in the eternal life of God.44 For Augustine, the eternal generation of the Son, which anticipates the sending of the Son into the world, speaks of the “absolute equality” of the Father and the Son.45 On this basis they are one in being and attributes—and authority is a divine attribute.46 I quote Augustine, “The Father is almighty, the Son is almighty, the Spirit is almighty; yet there are not three almighties but one almighty.”47 What Claunch fails to recognize is that Augustine’s doctrine of the Trinity excludes on principle the idea that the Son is eternally set under the Father and must obey him. The Father, Son, and Spirit are the one God, equal in all things. In his essay, “’That God May Be All in All’: The Trinity in 1 Corinthians 15,” James Hamilton accuses Erickson and me of not adequately dealing with 1 Cor 15:24–28.49 this text speaks of the Son on the last day handing over the kingdom of God to the Father. He says we err in not considering these words in the light of the whole argument Paul is making in this chapter. I like his conclusion: this whole chapter is an argument “that the resurrection of Jesus is a necessary component of the Gospel, and to deny the general resurrection, as some Christians do, undermines the Gospel.”50 But how this conclusion aids in the interpretation of vv. 24–28, he does not explain. Before considering his specific criticism of our handling of vv.24–28, it is to be noted that Hamilton believes, as do most of the contributors to this book, that orthodoxy teaches the ontological equality of the divine persons and the eternal role subordination of the Son.51 Yet, with one voice the Nicene fathers teach, in modern terms, the ontological equality of the three divine persons and their equal authority. Thus all the Reformation and post-Reformation confessions and the confession of faith of the Evangelical Theological Society, as we have already noted, speak of oneness in being and power in divine life. For the Nicene theologians, the Father and the Son work or function as one, not in a command structure. Hamilton is correct: the Arians, “would not have affirmed ontological equality,”52 but he fails to note that it was they, not the Nicene fathers, who taught the eternal functional subordination of the Son—his subordination in authority. The Nicene fathers held that, if the Son was not one in being with the Father, then he was not one in power with the Father, and vice versa. They never spoke of the “role” subordination of the Son, as Hamilton claims they did. They spoke rather of the “works” or “operations” of the divine persons, arguing that they worked “inseparably.” The term “role” and the idea of assumed “roles” is not found in the Nicene fathers, and the word “role” is not found in any of the most-used English translations of the Bible.53 I agree with Letham that in the cause of truth the word “role” should not be used in any discussion on divine life and action.54 And, I would add, it should not be used to interpret the Bible on the male-female relationship. We do not simply play the “role” of being a man or woman. We are a man or a woman. The pro-Nicene fathers, as well as Erickson and I, believe that ontological equality excludes absolutely any necessary and eternal (functional) subordination/submission. To suggest otherwise is “nonsensical.”55 If the Son is eternally subordinated to the Father and cannot be otherwise, then his subordinate status speaks not only of his function or “role” but of his person—who he is. What is more, Arians in the middle of the fourth century explicitly confessed the Son to be truly God, even if neither they nor the Nicene fathers ever spoke explicitly of “the ontological equality” of the Father and the Son. For example, the Second Sirmium Creed of 357, which none deny is an Arian Creed, first confesses the Son “to be begotten of the Father . . . before all ages, God from God, Light from Light, by whom all things were made” before speaking of his eternal subordination. What this means is that Arians in the middle of the fourth century, like most complementarians today, confessed the Son to be truly God without any caveats, yet eternally subordinate to the Father as well. Compared to what I say in this critique of One God in Three Persons, what Letham says is far more telling. It inflicts a mortal blow to the complementarian hierarchically ordered doctrine of the Trinity. He gives a profound and informed rejection of virtually every assertion that the other contributors make and of the primary thesis of this book, namely that the creaturely terms “father” and “son” define the triune relationships of the Creator. He brands this argument for the Son’s eternal subordination “Arian,” “heretical” and a “serious error.” We can only wonder whether the editors understood what Letham was saying. “True Sonship—Where Dignity and Submission Meet: A Fourth Century Discussion” is the title of Michael Ovey’s chapter.62 He is the principal of Oak Hill, a prestigious evangelical Anglican theological college in England. You would imagine someone holding this position would appeal first to the Nicene and Athanasian Creeds and then to the Thirty-Nine Articles, binding on all Anglicans, in seeking to outline the orthodox doctrine of the Trinity. Instead, Ovey appeals to a number of contentious creeds from the middle of the fourth century, a quotation from the Arian bishop Basil of Ancyra, and a selected quotation from Hilary of Poitiers, which all reflect either the confused theological thinking in this period or explicitly Arian teaching. He also appeals to the fact that Athanasius speaks of a divine Father-Son relationship. Commendably, he outlines his thesis succinctly and clearly. Ovey is unambiguous; the Arian and pro-Nicene fathers both “held to the submission of the Son outside the incarnation.” They only differed on what is the basis for this “submission” or “subordination” of the Son (he uses both terms interchangeably). For all those called “Arians,” the Son is subordinate because he is a creature, not truly God. In contrast, for all the pro-Nicenes, the Son is God yet eternally subordinate because he is “the Son” and like all sons he is set under his father’s authority. Paradoxically, what Ovey has proven is that the complementarian doctrine of the Trinity he and most other contributors to this book espouse reflects Arian theology in the middle of the fourth century: The Son is truly God but he is eternally subordinate or submissive to the Father. In the next essay, “Augustine and His Interpreters,” John Starke, in opposition to every patristic scholar I have read, argues that Augustine teaches an “order of authority and submission” in which the Father rules over the Son. In contrast, the erudite patristic scholar J. N. D. Kelly says that, for Augustine, “the unity of the Trinity is squarely in the foreground, subordinationism of every kind is excluded.”69 Similarly, Letham says that for Augustine, “The inseparability of the persons in both being and action, in turn, is a reflection of their complete equality. All elements of subordination are pruned away.”70 Starke is of the opposite opinion. He argues that by speaking of the Son as eternally begotten of the Father and as “sent” by the Father into the world, Augustine shows that he believed that there is an “an order of initiating authority and receptive submission between the Father and the Son.”71 This is absurd. If this book were not a scholarly publication his conclusion would not deserve comment. For Augustine “the Son is equal to the Father in every respect,”72 only subordinate by his own choice in that he took the “form of a servant” for our salvation. I will not comment on Michael Hakin’s essay on the doctrine of the Trinity espoused by eighteenth century Particular Baptists, for I cannot see how it bears on the topic addressed in the book or in this review. Ch. 9 is Philip Gons and Andrew Naselli’s essay, “An Examination of Three Recent Philosophical Arguments Against Hierarchy in the Immanent Trinity,” which I pair with the concluding essay by Bruce Ware, “Does Affirming an Eternal Authority-Submission Relationship in the Trinity Entail a Denial of Homoousios,” for they cover much the same ground. They alike reject the argument presented by the well-informed philosophical theologians Tom McCall, Keith Yandell, and Millard Erickson, that to insist that the Son is necessarily and eternally subordinated to the Father in authority implies his ontological subordination, and as such is a denial that the Father and the Son are one in being (Greek homoousios). Gons and Naselli’s ignorance of historical theology is immediately disclosed in that they assume that “hierarchical ordering” in the immanent Trinity is orthodoxy. Virtually all informed theologians see hierarchical ordering in divine life as the essence of the Arian error and the heresy called “subordinationism.” They and Ware also show that they have not grasped historic orthodoxy in that they separate and distinguish between what is true of the one divine essence/being and what is true of the divine persons.78 The three persons are the one divine being; there is no divine being or essence apart from the persons. What the divine persons are in unity, they are as Father, Son, and Spirit. I will make no attempt at a reply to their attempts to ward off the philosophical objections to their doctrine of the eternal subordination of the Son in authority, first because I am, like Gons and Ware, not a philosophical theologian, and second, because it has been done superbly by Thomas McCall, an especially competent philosophical theologian. I warmly commend McCall’s work.79 I will focus rather on the theological argument that Gons, Naselli, and Ware make in reply. They point out that orthodoxy eternally differentiates the Father and the Son on the basis of differing origination—the Father begets, and the Son is begotten—which is true, and I have made the point many times. They believe this indicates that each divine person has a unique “property,” so to differentiate the persons by differing origination, or as complementarians do, by differing authority, does not imply ontological subordination or the denial of homoousios. Again what they say reveals a failure to understand Nicene orthodoxy. The Nicene fathers insisted that differing origination was the one safe way indelibly to differentiate the Father and the Son (and the Holy Spirit) because this alone did not call into question divine oneness and equality or allow the subordination of the Son in the eternal life of God in any way. It is because the Son is eternally begotten of the Father that he is, as the Nicene Creed says, “God from God, Light from Light, true God from true God . . . one in being with the Father.” Differentiating the Father and the Son on the basis of differing authority, all the pro-Nicene fathers clearly saw, entailed the sub-ordering of the Son, the essence of the Arian error. In conclusion, I must admit that I can find little to commend in this book with the exception of Letham and Oliphint’s essays which accurately reflect orthodoxy, but what they say is drowned out by the other ill-informed essays that reflect an Arian understanding of the doctrine of the Trinity, a doctrine rejected by the Nicene fathers and excluded by the creeds and confessions. Should any reader want to discover what in fact orthodoxy teaches, the best place to begin would be the Athanasian Creed which sums up the catholic, or universal Christian, faith on the Trinity and on the person of Christ. Then they should move to the books on the Trinity written by competent patristic scholars who in most cases know nothing at all of the distinctive post-1977 complementarian doctrine of a hierarchically ordered Trinity. I list the best of these in endnote 2 below. Finally, I return to where I began. Grudem is convinced that “the most decisive factor in finally deciding” the bitter debate between evangelicals about the status and ministry of women is what is believed about the Trinity. I disagree because I am convinced that the Trinity in no way defines the male-female relationship on earth, and appeal to the Trinity is therefore irrelevant and bad theology. If, however, Grudem’s view is accepted—as do most of the writers in One God and, I suspect, most complementarians—then these evangelicals are left with only two starkly opposed options. They can endorse the Knight- Grudem-Ware doctrine of a hierarchically ordered Trinity, following the Arians. Or, they can endorse the Nicene doctrine of a co-equal Trinity enunciated clearly and unambiguously by Athanasius, the Cappadocian fathers and Augustine, codified in the Nicene and Athanasian creeds, reaffirmed by the Reformers, and now spelled out in the Reformation and post-Reformation confessions. To opt for the second choice is, of course, difficult for complementarians because, given Grudem’s argument, it would involve abandoning belief in the permanent subordination of women. I of course strongly recommend this path because I do not believe the Bible makes the subordination of women the creation ideal; to argue that women are permanently subordinated to men demeans them, and to do so in our age makes as much sense as believing that the world is flat. 1. Wayne Grudem, Evangelical Feminism and Biblical Truth (Sisters: Multnomah, 2004), 411 n. 12. Arian Controversy 318– 381 (Edinburgh: T.&T. Clark, 1988); E. Fortman, The Triune God; A Historical Study of the Doctrine of the Trinity (Grand Rapids: Baker, 1982); J. Behr, The Nicene Faith, 2 vols. (Crestwood: St Vladimir’s Seminary, 2004–2006); T. F. Torrance, The Christian Doctrine of God: One Being Three Persons (Edinburgh: T.&T. Clark, 1996); S. Holmes, The Holy Trinity: Understanding God’s Life (Milton Keyes; Paternoster, 2012). 3. Bruce Ware and John Starke, eds., One God in Three Persons: Unity of Essence, Distinction of Persons, Implications for Life (Wheaton: Crossway, 2015), back cover. Evangelical Statement on the Trinity,” Priscilla Papers 25, no. 4 (Autumn 2011): 16. In both cases the connection is incidental to what else they say. I am sure other egalitarians have appealed to divine life in support of gender equality; my point is simply that it is not an argument in any of the better known and most informed books by evangelical egalitarians. 6. Ronald W. Pierce and Rebecca Merrill Groothuis, eds., Discovering Biblical Equality: Complementarity without Hierarchy (Downers Grove: InterVarsity, 2005). 7. I fully document this fact in Jesus and the Father: Modern Evangelicals Reinvent the Doctrine of the Trinity (Grand Rapids: Zondervan, 2006), 20–32. 9. T. H. McCall, Which Trinity? Whose Monotheism? Philosophical and Systematic Theologians on the Metaphysics of Trinitarian Theology (Grand Rapids: Eerdmans, 2010), 175–88. 10. K. E. Johnson, “Trinitarian Agency and the Eternal Subordination of the Son: An Augustinian Perspective,” Them 36 (2011): 22–24. 11. One of the clearest and most telling essays in opposition to the complementarian doctrine of the Trinity is given by Letham in ch. 5 of One God. See my discussion of his chapter below. Early in our debate with each other I said a few things I would now word more carefully, and I suspect Letham would say the same about what he has written. On the basis of such comments by Letham, some of the writers in this book quote him in support of their erroneous ideas. See One God, 11 n.1, 157, 162, 166, 170, 195 n. 2, 197 n. 7. Some of the appeals to what Letham says on “order” in divine life are wrongly understood. For him order in divine life does not imply hierarchical order. 12. Kevin N. Giles, Jesus and the Father: Modern Evangelicals Reinvent the Doctrine of the Trinity (Grand Rapids: Zondervan, 2009). 13. Giles, Jesus and the Father, 205–41. 14. Giles, Jesus and the Father, 172–99. 15. Robert Letham, “Eternal Generation in the Church Fathers,” in One God 123. 16. Grudem, “Doctrinal Deviations in Evangelical-Feminist Arguments about the Trinity,” in One God, 19. 17. Grudem, “Doctrinal Deviations,” in One God, 29. 18. Grudem, “Doctrinal Deviations,” in One God, 32–37. 19. Grudem, “Doctrinal Deviations,” in One God, 37. 20. Letham, “Eternal Generation,” in One God, 121. For more detail see Giles, Jesus and the Father, 109–10. 21. Saint Augustine: The Trinity (trans. E. Hill; New York: New York City Press, 1991), 1.3.14 (p. 74), 1.4.22 (p. 82), 2.1.2 (pp. 98–99), etc. 22. Ayres, Nicaea and its Legacy, 279. 23. Ayres, Nicaea and its Legacy, 280. 24. Christopher W. Cowan, “‘I Always Do What Pleases Him’: The Father and Son in the Gospel of John,” in One God, 48. 25. Cowan, “The Father and Son in the Gospel of John,” in One God, 48, 51, 53 (twice), 59, 61, 64. 26. See further, K. N. Giles, “Defining Subordinationism,” EQ 72, no.3 (2015): 207–24. 27. See further on this K. N. Giles, “The Evangelical Theological Society and the Doctrine of the Trinity,” EQ 80, no. 4 (2008): 323–38. 29. Robert Letham, The Holy Trinity in Scripture, History, and Worship (Phillipsburg: P&R, 2004), 147. See also pp. 383, 400, 484, 489, 491–93. 30. Saint Augustine: The Trinity, 2.2.7 (p. 101). 31. Saint Augustine: The Trinity, 4.29 (p. 174). 32. See my argument in Jesus and the Father, 119–21, and my appeal to scholarly opinion in support. 34. Frame, Doctrine of God, 661. 35. Who could possibly deny that the two sexes together complete what it means to be human and that procreation is not possible without the complementary contribution by both sexes? 36. See Kevin Giles, “The Genesis of Confusion: How ‘Complementarians’ Have Corrupted Communication,” Priscilla Papers 29, no. 1 (Winter 2015): 27–28. 37. Clyde Claunch, “God is the Head of Christ: Does 1 Corinthians 11:3 Ground Gender Complementarity in the Immanent Trinity?” in One God, 67. 38. Claunch, “God is the Head of Christ,” in One God, 88–89. 39. Claunch, “God is the Head of Christ,” in One God, 76–78. 41. Claunch, “God is the Head of Christ,” in One God, 67. 42. Claunch, “God is the Head of Christ,” in One God, 90–91. 43. See further, Giles, Jesus and the Father, 109–10. 44. Claunch, “God is the Head of Christ,” in One God, 90. 45. Saint Augustine: The Trinity, 1.1 (p. 65). 46. Saint Augustine: The Trinity, 3.12 (p. 197). For extensive documentation from Augustine’s writings on these matters see Giles, Jesus and the Father, 152–56, 190–94, 227–30 and K. N. Giles, The Eternal Generation of the Son: Maintaining Orthodoxy in Trinitarian Theology (Grand Rapids: Zondervan, 2012), 151–63. 47. Saint Augustine: The Trinity, 5.9 (p. 195). 48. Claunch, “God is the Head of Christ,” in One God, 88. 49. After I wrote this review, late in the editing stage I read Wesley Hill’s superb book, Paul and the Trinity: Persons, Relations, and the Pauline Letters (Grand Rapids: Eerdmans, 2015). For a convincing theological interpretation of 1 Cor 15:24–28 in conformity with the Nicene faith, I could not recommend his work too highly. 50. James Hamilton, “That God May Be All in All: The Trinity in 1 Corinthians 15,” in One God, 102. 51. Hamilton, “’That God May Be All in All,” in One God, 95–96, 105, 106, 108. 52. Hamilton, “That God May Be All in All,” in One God, 106. 53. See Giles, “The Genesis of Confusion,” 23–24. 54. Letham, “Eternal Generation,” in One God, 123, 125. 55. Hamilton, “That God May Be All in All,” in One God, 95. 56. Hamilton, “That God May Be All in All,” in One God, 108. 57. Letham, “Eternal Generation,” in One God, 123. 58. Letham, “Eternal Generation,” in One God, 123, 125. 59. Letham, “Eternal Generation,” in One God, 123–24. 60. Letham, The Holy Trinity, 179 and n. 29, 259, 383. 61. Letham, “Eternal Generation,” One God, 122. 62. For an extended critical review of Ovey’s chapter see http://www.psephizo.com/gender-2/complement-arianism/. 63. Michael J. Ovey, “True Sonship—Where Dignity and Submission Meet: A Fourth-Century Discussion,” in One God, 130–31. He restates his thesis on p. 50. 64. Ovey, “True Sonship,” in One God, 129. For the full text of these creeds see Hanson, The Search, and Athanasius, “On the Councils,” Nicene and Post Nicene Fathers, vol. 4 (New York: Christian Literature Company, 1892), henceforth quoted as NPNF. 65. Hanson, The Search, 286; NPNF 4, “On the Councils,” 23 (p. 461). 66. Hanson, The Search, 309–10. 67. Hanson, The Search, 326–29; NPNF 4, “On the Councils,” 27 (p.464). 68. Here we need to note that in the middle of the fourth century most bishops were wary of the term homoousios. They feared it opened the door to Sabellianism (modalism) and they noted the word was not found in the Bible. 69. J. N. D. Kelly, Early Christian Doctrines (London: Adam & Charles Black, 1968), 273. 70. Letham, The Holy Trinity, 199. 71. John Starke, “Augustine and His Interpreters,” in One God, 171. 72. Saint Augustine: The Trinity, 6.1.6 (p. 209). 73. See my detailed account of Augustine on the sending of the Son with many quotations from his writings in, Jesus and the Father, 191–92 and The Eternal Generation of the Son, 152–62. 74. Saint Augustine: The Trinity, 4.5.27 (p. 172). See also 4.5.29 (p. 174). 75. Saint Augustine: The Trinity, 1.2.7 (p. 69). 76. Saint Augustine: The Trinity, 1.1.1 (p. 65). 77. Saint Augustine: The Trinity, 1.3.14 (p. 74), 1.3.15 (p. 75), 1.4.22 (p.82), 1.4.24 (p. 83), 2.1.3 (pp. 98–99), etc. 78. Philip R. Gons and Andrew David Naselli, “An Examination of Three Recent Philosophical Arguments against Hierarchy in the Immanent Trinity,” in One God, 205; Bruce A. Ware, “Does Affirming an Eternal Authority-Submission Relationship in the Trinity Entail a Denial of Homoousios? : A Response to Millard Erickson and Tom McCall,” in One God, 243, 245, 247. 79. Thomas McCall, “Gender and the Trinity Once More: A Review of One God in Three Persons: Unity of Essence, Distinction of Persons, Implications for Life” (ed. Bruce A. Ware and John Starke; Wheaton: Crossway, 2015), TJ (Fall 2015): forthcoming. 80. K. Scott Oliphint, “Simplicity, Triunity, and the Incomprehensibility of God,” in One God, 223. 81. Oliphint, “Simplicity,” in One God, 229. 82. Oliphint, “Simplicity,” in One God, 233. See also, for the same point in other language, p. 234. 83. Dennis Jowers, “The Inconceivability of Subordination within a Simple God,” in The New Evangelical Subordinationism? Perspectives on the Equality of God the Father and God the Son (ed. Dennis Jowers, W. Jowers, and H. Wayne House; Eugene: Wipf and Stock, 2012), 375–410.